Wednesday December 5th… Dear Diary. The main purpose of this ongoing post will be to track United States extreme or record temperatures related to climate change. Any reports I see of ETs will be listed below the main topic of the day. I’ll refer to extreme or record temperatures as ETs (not extraterrestrials)😊. 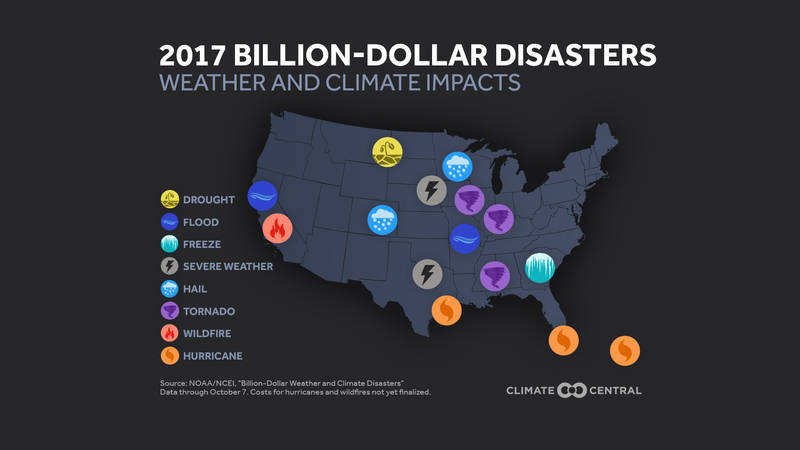 NOAA NCEI reported 11 weather and climate disasters with over $1 billion in damages through September (they report quarterly). When the final 2018 numbers are released in January, Hurricane Michael will be added as the 12th and other events could exceed the billion-dollar threshold. November’s individual wildfires will not count separately; according to NOAA lead analyst Adam Smith, “our analysis treats U.S. billion-dollar wildfire and drought events as regional-scale, seasonal events, not as multiple isolated events. Therefore, this year’s Western wildfire analysis will again be treated as one event.” However, the cost of each fire will certainly be counted. Last year’s wildfires tripled the previous cost record, and this year’s total could eclipse the new record of $18 billion. 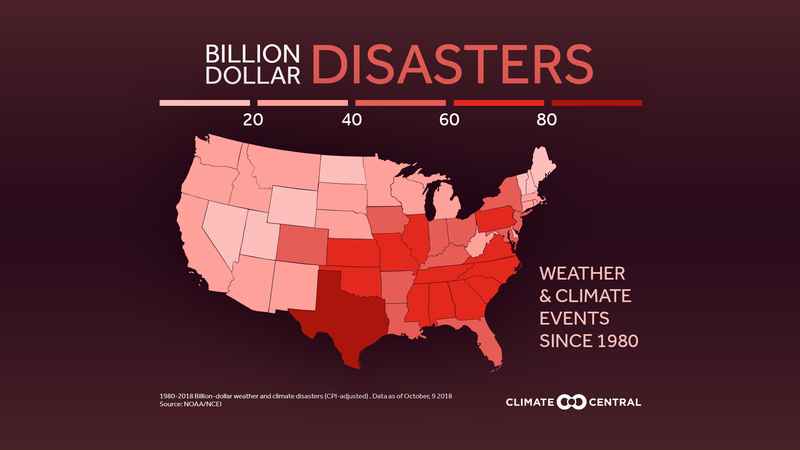 Billion-dollar disasters are happening across the country, and climate change is often linked. By creating hot and dry conditions in the West, human-caused climate change has doubled the cumulative forest fire area burned since 1984. Warmer oceans are fueling the rapid intensification of hurricanes, while a warmer and wetter atmosphere intensifies their rainfall. (Note: next week’s Climate Matters will have more on this year’s rainfall extremes). A warmer atmosphere could also strengthen severe thunderstorms in the Plains and Midwest, although connections between wind shear and climate change are still being researched. For more information on how climate change relates to extreme weather, click here. Topics include: coastal flooding, drought, extreme heat, heavy rain & flooding, severe weather, snow & ice, tropical weather, and wildfires. 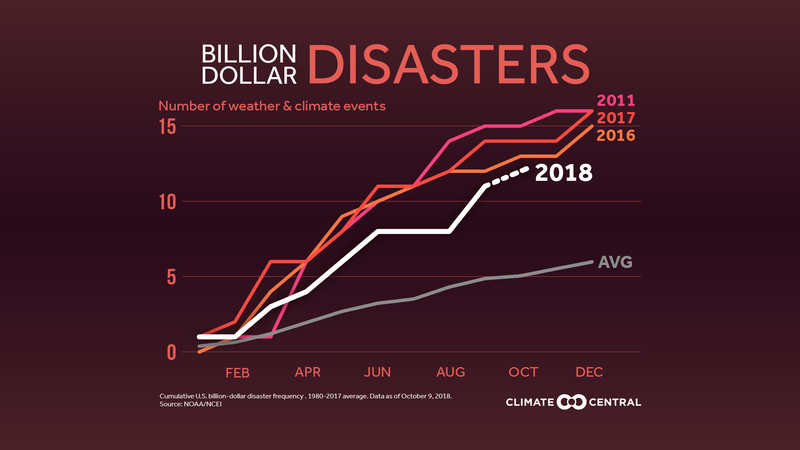 Data comes from NOAA NCEI: U.S. Billion-Dollar Weather and Climate Disasters (1980 through October 9, 2018). The cost has been adjusted for inflation using the Consumer Price Index (CPI). The methodology developed by NOAA NCEI, with input from economic experts and consultants to remove biases, can be found at https://www.ncdc.noaa.gov/billions/overview. Additional review of the methodology can be found in Smith and Katz, 2013. You may recognize a few: Hurricanes Harvey, Irma, Maria, and the California Carr fire. What will exact astronomical damage figures be for 2018 be once Michael and this year’s California fires get added to statistics? I’ll report those as soon as I’m informed. Looking at trends I fear that a reckoning will occur during the 2020s with society, as it usually does, reacting both badly and well to a new, stark reality. Let’s all look to the better angels of our nature to solve the climate crisis. Since 2011, China's carbon dioxide emissions have been nearly constant. Some even speculated that China might have peaked. We can’t burn our way out of the climate crisis: "Burning trees in power plants is a vision from Mordor, not one of #CleanEnergy." What is the @IPCC_CH Special Report on Global Warming of 1.5ºC all about..? Watch the brilliant trailer! Extreme Temperature Diary- December 4th , 2018/ Topic: Old Fashioned Winter Storms…How Long Will They Last? 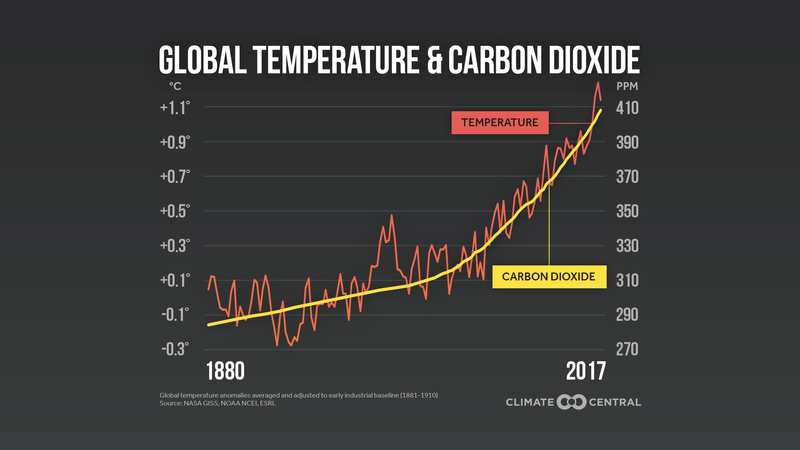 Extreme Temperature Diary- December 6th , 2018/ Topic: Big Jump In Emissions…Now No Hope? I’m curios about a question that maybe you could help me that is tangential to your discussion above. What is the thinking about equity markets? At what point will stocks become valueless as they will have no future value??? I would expect that some day in the not to distant future for there to be a sort of “bank run”. Is there any serious thinking about this issue??? What you are describing is a dystopian future in which our civilization starts to collapse due to climate change. It’s my hope that in the next few decades the worst effects can be avoided as emissions drop. Until then there will be greater pressure on insurance companies as the number of billion dollar disasters rise. The market is very resilient, though.